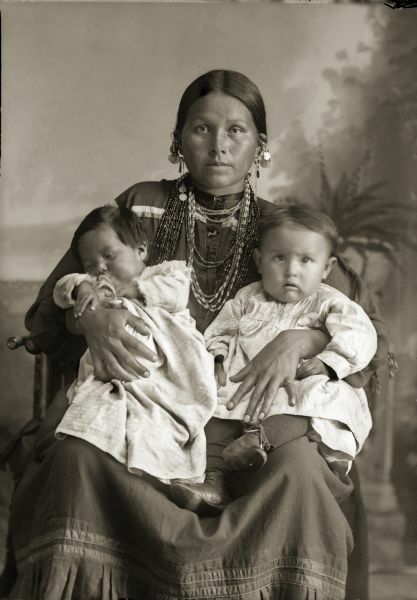 Studio portrait of Mountain Wolf Woman, also known as Stella Blowsnake Whitepine Stacy (HayAhChoWinKah), sitting and holding her two daughters, Josephine Whitepine Mike (AhHooGeNaWinKah), left, and Lena Whitepine Shegonee (HaCheDayWinKah). Mountain Wolf Woman is also the title of a book written about her by Nancy Lurie. This image was used in "People of the Big Voice," published by Wisconsin Historical Society Press (2011).